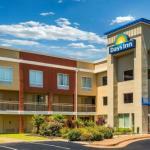 Comfy accommodations a heated pool and a location near two interstates are a few of the reasons why the Days Inn Florence Near Civic Center is one of the top hotels in the area with our guests especially business travelers. Each of the three-floor Days Inn Florence Near Civic Center's 129 non-smoking suites offers free Wi-Fi a flat-panel TV a coffeemaker and ironing equipment. Some rooms offer microwaves and mini-fridges. Make time for yourself in the heated outdoor pool and fitness room and save time with express check-in/check-out. Road warriors will appreciate the on-site laundromat. Pets are allowed for a non-refundable sanitation fee; contact hotel for details. Free parking is available. Situated on the grounds of Magnolia Mall near the intersection of I-95 and I-20 the Days Inn offers access to shopping dining and more. Walk three blocks to the Florence Civic Center a movie theater and several restaurants or drive five miles east to the center of town to catch a show at the Florence Little Theatre shop the downtown promenade on Evans Street or check out the Florence Railroad Museum in a renovated box car. You can be at Darlington Raceway in 20 minutes. Florence Regional Airport is seven miles east.